E-commerce is defined as the buying and selling of products or services exclusively through electronic channels. There are three main branches of electronic commerce; the most well-known form being online shopping, also known as business to consumer (B2C). Here individuals can order various products and pay for their purchase via internet. Another category of e-commerce is business to business (B2B), where companies, such as manufacturers, wholesalers or retailers exchange products and/or services. The third category of e-commerce involves transactions from consumer to consumer (C2C), as in the example of eBay, Etsy or other similar websites. The e-commerce market in the United States has been constantly evolving over the past decade. 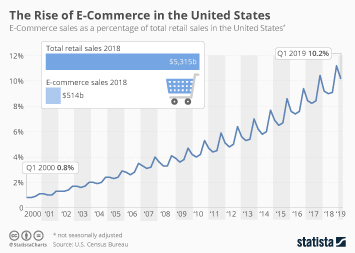 Retail e-commerce sales in the United States are projected to grow at a fast pace in the coming years, going from 505 billion U.S. dollars in 2018 to over 735 billion US dollars in 2023. Amazon is by far the most popular e-retailer in the United States. The company also ranks ahead of the pack in terms of U.S. e-retail sales - in 2018, the company generated over 235 billion U.S. dollars via retail e-commerce sales in the United States. Amazon also has the most popular mobile shopping apps in the country in terms of reach and monthly users. Other successful online retailers include eBay – which was ranked as the most popular online marketplace by online sellers in the United States – Wal-Mart, Apple Sites and Target. Customer satisfaction with online retail in the U.S. is relatively high. However, online sales still represent only a small share of all retail sales in the U.S. – about 9.6 percent as of the third quarter of 2018. Nonetheless, an estimate of 78 percent of internet users in the United States had purchased products online in 2017. In the same year, 32 percent of internet users in the U.S. stated purchasing items via internet at least once a month, and 29 percent said they shopped online once or twice per week. Online retailers and brand websites are popular channels to purchase goods online but online marketplaces are gaining in relevance among online shoppers. A growing trend within the e-commerce market in the United States is the increasing presence of mobile shopping across all age groups. This large base of mobile buyers has an impact on mobile commerce revenue. Mobile retail revenue in the United States is expected to grow from 156 billion U.S. dollars in 2017 to about 420 billion U.S. dollars in 2021. M-commerce is also increasingly gaining ground as mobile sales already account for a significant share of e-commerce transactions in total. The number of mobile-only online shoppers accessing leading websites has been growing and consumers have come to expect a seamless mobile shopping experience, be it via browser or app.